Due to the recent announcement of a new solo Venom film speculators and collectors have been wondering which incarnation of Venom we will eventually see on the big screen. Anything is probably going to be better than what Topher Grace and Sony offered in Spider-Man 3. In this case there is a second character to consider thanks to an excellent series from 2011, Flash Thompson. So when did Flash first appear as Venom? Currently ASM 654 is considered his first. His origin was presented as a backup story and was probably the most creative thing done with Venom since his inception. Note: The comic below does not show material from ASM 654. The release date of ASM 654 was April 2011. Inside the comic below we have two dates: May 2011 and 2/28/2011. I suspect that the May date was added due to expected convention release. The second date in the Indicia is the printing date of this work and makes it the first appearance of Flash as Venom and is his first cover appearance. This book previews issue one of the Venom series which debuted in May of 2011. This comic book was a con exclusive. 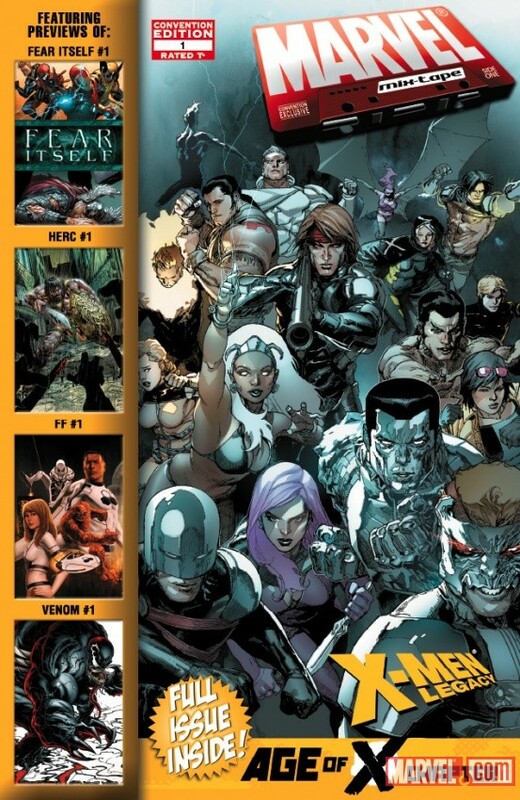 All the other Marvel mix-tape comics indicate the con for which they will be distributed at. This book does not. After some research I have learned that this book was released at Wondercon 2011 at the start of April so even if this book had an April publication date it would likely still predate ASM 654 considering April 1 was a Friday. Because this comic has a date of 2/28/2011 and thanks to its April distribution I see no reason that it should not be considered the first appearance/first cover appearance of Flash Venom. To date I have found no other book which predates this one. April 2, 2019 Agent Venom, Silent Bob, Alex Ross and More! A la Marvel point one? Nice try. Marvel’s website list the release date of Amazing Spider-man 654 as 2/9/11. The comic has a release date of April because comics follow the magazine tradition of listing a later month to ensure a longer shelf life on the magazine rack. AMS 654 is still the first appearance of Flash as Venom. This comic has a date of production feb of 2011. 654 may very well have an earlier production date, I am honestly not sure. 654 has a release date of April 2011. The first day in April it could have been available for consumer purchase would have been Wed April 6th. The mix-tape comic was made available for consumers at Wondercon 2011 Friday April 1 through Sunday April 3. Even if 654 was released in April it would have had to come out on Friday 1 putting it’s release on the same date as this issue. It was not. To me it looks like this comic was released earlier than 654. 654 was not released on 2/9/2011. I did as much research on this book as one could. If I am wrong and 654 was released prior to Friday April 1 then so be it. I just noticed that too. Midtown has Amazing Spider-man # 654 being released on 2/9/2011. Sorry but it was released on 2/2/20111 not 2/9. Nope not new to buying or selling. I am pretty sure my comments here support finding the truth about the issue. One thing though, cover and interior dates of comic books are not “always” dated 2 months after the release date. They are plenty of examples of the date in the indicia of a comic book matching the release date, even from Marvel.